My third installment of Re-Vamping Vintage shows how you can alter jewelry items! 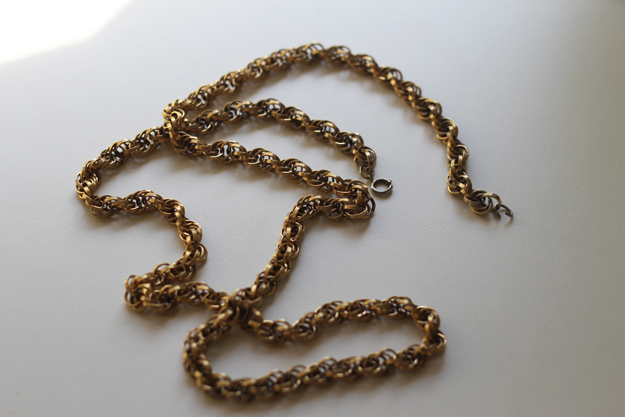 During a recent thrift/vintage store shopping excursion, I found this long gold chain necklace for $11. But I've been wanting a shorter chunky gold chain necklace....no problem! With my jewelry pliers, this is a simple task. Determine desired length. 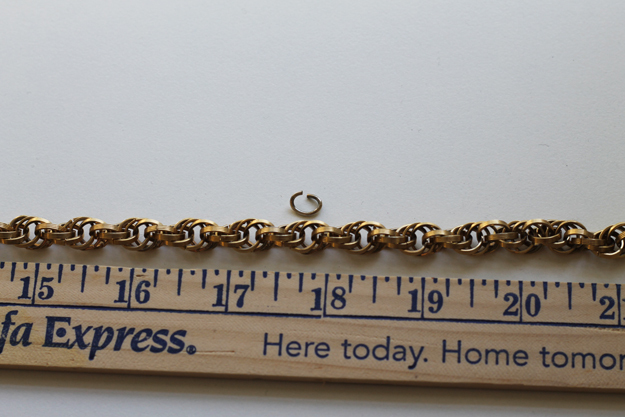 I opened the jump ring on the end of the necklace (originally about 39 inches) and measured my new length, 18 inches. 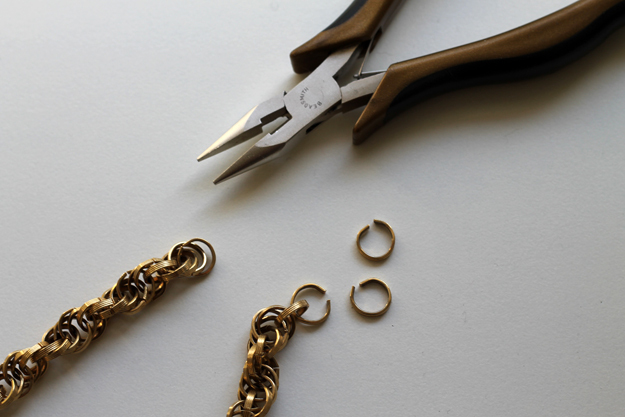 Using small pliers, I opened the rings on the necklace, splitting it into two parts. Connect original jump ring to the end of the new length. Fasten with original clasp. 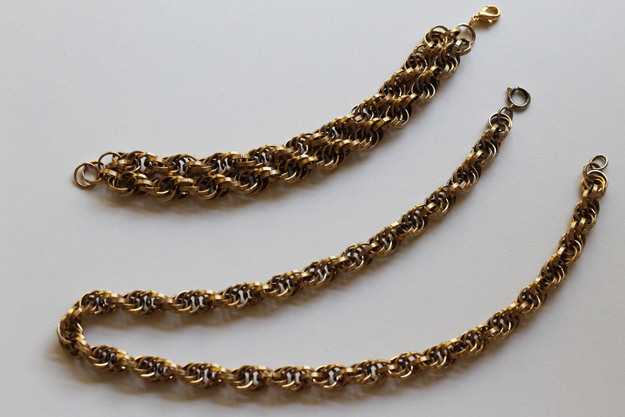 Since I plenty of chain left over, I decided to make a double-chain bracelet using an extra jump ring and clasp. 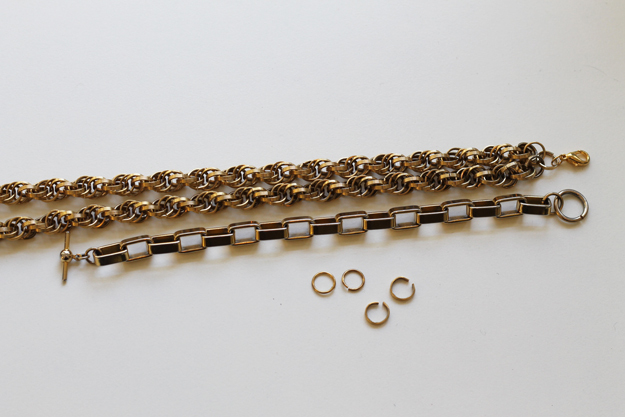 For length, I measured the chain against a bracelet that already fit nicely, then I followed the same steps of opening and closing the links/jump rings to attach the findings. And now, instead of one long necklace, I have a shorter necklace and a double-chain bracelet. The only things I added were an additional jump ring and clasp for the bracelet. Click for Re-Vamping Vintage Part I and Part II. You are so crafty and creative!!! it look very nice... I love the chain! Thats a great idea. The bracelet looks great. Great idea, good tutorial and wonderful result! I like your style! You have an inspiring blog, it's so creative! Great idea! Thank you for sharing it. I really love this DIY! What a great vintage find and update. So cool that you also got a great bracelet out of this. OMG. You're blog makes me smile EVERY TIME. You are always putting up fresh and interesting material! Your blog never lets me down. Me and my girlfrend, Charlotte (CURLCRAVE) continue to LOVE your blog. What a great halloween costume! What are u being for halloween?